Melasma is caused by excessive or uneven distribution of pigment melanin in the skin but the reason why this is happening is unknown and that is why it is not possible to address the cause - you can only treat the symptoms. Sun protection is crucial because pigment producing cells (melanocytes) produce melanin upon sun exposure (melanin is our natural UV filter). I have not recommended applying zinc based creams immediately after dermarolling because zinc oxide has astringent (contracting biological tissue) effects and it dries out the skin. The skin should be kept moisturized right after dermarolling. However, it is very important to protect the dermarolled skin from the sun so if you have to go outside immediately after microneedling, moisturize the skin (preferably with for example almond oil and apply sun protection on top of it. You can apply zinc-based cream a day after dermaneedling but it would be still wise to apply a little oil first. In your case, I recommend buying a 0.5 mm dermastamp (not a dermaroller) and using it three times a week to enhance skin lightening product (such as hydroquinone) to the affected area. Do it for three months and then a one month break and so on. Copyright © 2011 G. Fabbrocini et al. Melasma is a common hypermelanotic disorder affecting the facial area which has a considerable psychological impact on the patient. Managing melasma is a difficult challenge that requires long-term treatment with a number of topical agents, such as rucinol and sophora-alpha. Aims. We aim to compare the combined treatment of skin needling and depigmenting serum with that using depigmenting serum alone in the treatment of melasma, in order to evaluate the use of microneedles as a means to enhance the drug's transdermal penetration. Methods. Twenty patients were treated with combined skin needling and depigmenting serum on one side of the face and with depigmenting serum alone on the other side. The outcome was evaluated periodically for up to two months using the Melasma Area Severity Index score and the Spectrocolorimeter X-Rite 968. Results. The side with combined treatment (skin needling + depigmenting serum) presented a statistically significant reduction in MASI score and luminosity index (L) levels compared to the side treated with depigmenting serum alone, and clinical symptoms were significantly improved. Conclusions. Our study suggests the potential use of combining skin needling with rucinol and sophora-alpha compounds to achieve better results in melasma treatment compared to rucinol and sophora-alpha alone. I am very glad you see some results. Renewal of the skin after dermaneedling makes the skin temporarily dry and this is normal but your choice of not rolling very frequently is wise. Stamping or needling can sometimes result in long-term redness and that is also normal. The regeneration is in process. If the redness bothers you, try to diminish it by a nonsteroidal anti-inflammatory preparation. Buy NUROFEN rapid capsules or NAPROXEN capsules, pierce the capsule and apply a little, three times a day on your red spots. It may help. Dermarolling / Microneedling / Re: What type of scars is the needle-suctioning method for? And what's the downtime? Needling is a much more intensive treatment than dermarolling and thus the needled areas remain red longer. Even three weeks of redness is not exceptional. So there is nothing wrong. The regeneration is in process. If the redness is caused by residual inflammation, applying an OTC topical non-steroidal anti- inflammatory such as Ibuprofen or Diclofenac gels will help. Try it. Do not buy an anti-inflammatory gel/cream containing steroids. Steroids cause stretch marks. It must be non-steroidal. Or buy NUROFEN rapid capsules or NAPROXEN capsules and pierce them. They both contain a nonsteroidal anti-inflammatory substance. If the redness is caused by your skin producing more melanin pigment (the pigment is normally present in the skin), you should be patient and leave it. It will eventually diminish. White stretch marks lack melanin pigment, so pigment production is desirable in case of white scars. Dermarolling / Microneedling / Re: Can I roll with 0.5 mm 3 days after rolling with 1.5 mm? You can start using a 0.5 mm roller if the skin is no longer red, dry, tender etc. from the 1.5 mm rolling. 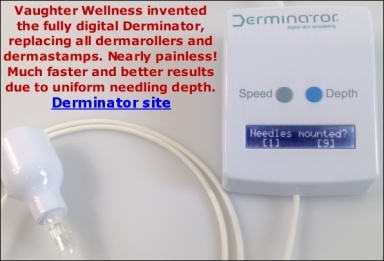 Do not use any dermaroller if you have scabs (they sometimes form after needling or stamping) . Do not pick on the scabs - it could cause scarring. Let them fall off naturally. Do not use anything that can make the scabs fall off prematurely- such as exfoliation, massage etc. Dermarolling / Microneedling / Re: Topical Collagen and Derma Rolling? Thank your compliment on our website! Dermal collagen is a huge molecule and it is not able to penetrate when topically applied. If you decide to apply it, do it after dermarolling. However, even if you manage to get it deeper into the skin with dermarolling or some new nano-method, this externally-supplied collagen will be eventually broken down and metabolized just like it happens with collagen injection fillers. Dermaneedling will trigger production of your own collagen and that is the best. Consuming collagen orally may be beneficial nevertheless there is no consensus concerning bioavailability of orally taken collagen. I recommend the single needles and Infadolan ointment for dermaneedling aftercare. As I mentioned above, you must be extra careful on the nose area. Infadolan is primarily intended for dermarolling aftercare. It can be used as a daily moisturizer (using just a little is enough) if your skin has no problem with its heavy consistency. Otherwise, use it only on dry parts, such as around the eyes, on the lips or on top of the hands, on dry, cracked heels etc. What skin condition do you plan to treat? Thanks for the compliment on the Infadolan - it's indeed ideal for dermaneedling after-care. If you still have questions after reading all that, just ask. "Scars on the nose All invasive skin treatments on the nose are risky because this area reacts and heals unpredictable and it can end up worse. You can try a 1 mm dermastamp but never perform any aggressive stamping here. Start slowly and try one small area first." This does of course not mean that it will always heal worse. It means some people will get improvement, some get no improvement and no worsening and some may theoretically end up worse. The nose has cartilage just below the skin and this (or something else) may be the reason why the skin on the nose sometimes heals badly after invasive skin procedures. Always do a test patch first. Have you been on Accutane? Accutane is known to sometimes cause impaired healing. Dermarolling unclogs pores. Clean pores may shrink due to the plugs being removed but they can also look bigger because the plugs make them basically flat and when you remove the plugs, you are left with empty holes. The plug's adhesion to the skin also serves to make the pore smaller. Dermarolling often causes skin tightening (which is good in case of lost skin that has lost its elasticity) but the tightening stretches out the skin, which in turn might enlarge the pores. In any case, this effect should be only temporary. Stop dermaneedling for a while to see how it develops. A lancet needle is a small knife. Their purpose is to cut the very tough skin of the finger to draw blood for glucose monitoring. And they are shaped to maximise bloodflow, cutting sideways through the skin. This shape is unsuitable for subtle microneedling. The shape of lancet needles is suitable for subcision but not for needling. (BTW I have always advised against performing subcision at home, only needling). Needles for needling have a conic shape with a very long taper and their length does not exceed 2 mm. Dermarollers also have conically shaped needles. Cactus needles are the right shape for needling, however they are too brittle and could easily break off inside the skin. The serum is better in your case. You can apply it right after stamping. It may sting a little.